"COX" redirects here. For other uses, see Cox (disambiguation). Crystallographic structure of prostaglandin H2 synthase-1 complex with flurbiprofen. Cyclooxygenase-2 (Prostaglandin Synthase-2) in complex with a COX-2 selective inhibitor. Cyclooxygenase (COX), officially known as prostaglandin-endoperoxide synthase (PTGS), is an enzyme (specifically, a family of isozymes, EC 1.14.99.1) that is responsible for formation of prostanoids, including thromboxane and prostaglandins such as prostacyclin. Pharmaceutical inhibition of COX can provide relief from the symptoms of inflammation and pain. Nonsteroidal anti-inflammatory drugs (NSAIDs), such as aspirin and ibuprofen, exert their effects through inhibition of COX. Those that are specific to the COX-2 isozyme are called COX-2 inhibitors. In medicine, the root symbol "COX" is encountered more often than "PTGS". In genetics, "PTGS" is officially used for this family of genes and proteins, because the root symbol "COX" was already used for the cytochrome c oxidase family. Thus the two isozymes found in humans, PTGS1 and PTGS2, are frequently called COX-1 and COX-2 in the medical literature. The names "prostaglandin synthase (PHS)", "prostaglandin synthetase (PHS)", and "prostaglandin-endoperoxide synthetase (PES)" are older terms still sometimes used to refer to COX. Selectivity for COX-2 is the main feature of celecoxib, etoricoxib, and other members of this drug class. Because COX-2 is usually specific to inflamed tissue, there is much less gastric irritation associated with COX-2 inhibitors, with a decreased risk of peptic ulceration. The selectivity of COX-2 does not seem to negate other side-effects of NSAIDs, most notably an increased risk of renal failure, and there is evidence that indicates an increase in the risk of heart attack, thrombosis, and stroke through an increase of thromboxane unbalanced by prostacyclin (which is reduced by COX-2 inhibition). Rofecoxib (brand name Vioxx) was withdrawn in 2004 because of such concerns. Some other COX-2 selective NSAIDs, such as celecoxib, and etoricoxib, are still on the market. Fish oils provide alternative fatty acids to arachidonic acid. These acids can be turned into some anti-inflammatory prostacyclins by COX instead of pro-inflammatory prostaglandins. Calcitriol (vitamin D) significantly inhibits the expression of the COX-2 gene. Fish oils (e.g., cod liver oil) have been proposed as a reasonable alternative for the treatment of rheumatoid arthritis and other conditions as a consequence of the fact that they provide less cardiovascular risk than other treatments including NSAIDs. ↑ PDB: 1CQE​; Picot D, Loll PJ, Garavito RM (Jan 1994). 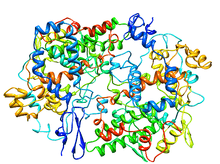 "The X-ray crystal structure of the membrane protein prostaglandin H2 synthase-1". Nature. 367 (6460): 243–9. doi:10.1038/367243a0. PMID 8121489. ↑ PDB: 6COX​; Kurumbail RG, Stevens AM, Gierse JK, McDonald JJ, Stegeman RA, Pak JY, Gildehaus D, Miyashiro JM, Penning TD, Seibert K, Isakson PC, Stallings WC (1996). "Structural basis for selective inhibition of cyclooxygenase-2 by anti-inflammatory agents". Nature. 384 (6610): 644–8. doi:10.1038/384644a0. PMID 8967954. ↑ Zhang Y, Mills GL, Nair MG (Dec 2002). "Cyclooxygenase inhibitory and antioxidant compounds from the mycelia of the edible mushroom Grifola frondosa". Journal of Agricultural and Food Chemistry. 50 (26): 7581–5. doi:10.1021/jf0257648. PMID 12475274. ↑ Zhang Y, Mills GL, Nair MG (2003). "Cyclooxygenase inhibitory and antioxidant compounds from the fruiting body of an edible mushroom, Agrocybe aegerita". Phytomedicine. 10 (5): 386–90. doi:10.1078/0944-7113-00272. PMID 12834003. ↑ O'Leary KA, de Pascual-Teresa S, de Pascual-Tereasa S, Needs PW, Bao YP, O'Brien NM, Williamson G (Jul 2004). "Effect of flavonoids and vitamin E on cyclooxygenase-2 (COX-2) transcription". Mutation Research. 551 (1-2): 245–54. doi:10.1016/j.mrfmmm.2004.01.015. PMID 15225597. 1 2 Cleland LG, James MJ, Proudman SM (2006). "Fish oil: what the prescriber needs to know". Arthritis Research & Therapy. 8 (1): 202. doi:10.1186/ar1876. PMC 1526555 . PMID 16542466. ↑ Albert D, Zündorf I, Dingermann T, Müller WE, Steinhilber D, Werz O (Dec 2002). "Hyperforin is a dual inhibitor of cyclooxygenase-1 and 5-lipoxygenase". Biochemical Pharmacology. 64 (12): 1767–75. doi:10.1016/s0006-2952(02)01387-4. PMID 12445866. ↑ Moreno J, Krishnan AV, Peehl DM, Feldman D (July–August 2006). "Mechanisms of vitamin D-mediated growth inhibition in prostate cancer cells: inhibition of the prostaglandin pathway". Anticancer Research. 26 (4A): 2525–30. PMID 16886660. ↑ Wallace JL (Oct 2008). "Prostaglandins, NSAIDs, and gastric mucosal protection: why doesn't the stomach digest itself?". Physiological Reviews. 88 (4): 1547–65. doi:10.1152/physrev.00004.2008. PMID 18923189. ↑ Kearney PM, Baigent C, Godwin J, Halls H, Emberson JR, Patrono C (Jun 2006). "Do selective cyclo-oxygenase-2 inhibitors and traditional non-steroidal anti-inflammatory drugs increase the risk of atherothrombosis? Meta-analysis of randomised trials". BMJ. 332 (7553): 1302–8. doi:10.1136/bmj.332.7553.1302. PMC 1473048 . PMID 16740558.